Building an online presence for your roofing company is challenging. You need a website of course, but that alone will not be enough to rank high on Google. To separate yourself from competitors, you need high quality content. Google has stressed the importance of quality content in their Webmaster Guidelines. Even so, they’ve stopped short of providing explicit instructions for writing perfect website content. That’s what we’re here for. First, you should understand why content is important to begin with. Why should you as a roofing contractor invest time, resources, and possibly money into content creation? To put it simply; content is one of the top Google search ranking factors. It explains your company, its services, and helps consumers make informed decisions about their roofing needs. Well-written content helps brand you as a professional, authoritative leader in your industry. To understand how to create perfect content, you first need to understand the building blocks of SEO (Search Engine Optimization) as of 2019 and how Google looks at your content. When you launch a website with multiple pages, the content on each page is eventually “spidered” by Google. What Google finds when they spider your site determines where they rank each page and for what keywords. Your homepage, for example, should explain who you are, what you offer, and indicate to Google the needs of users who will want to visit your website. 10 years ago, ranking content for roofing websites was easy, as long as you knew the basics of keyword placement. Today, securing top rankings is much more competitive and requires content that meets the need of the searcher. The old way of ranking content relied on “keyword stuffing” which meant repeating a term like roofing company over and over on a single page. Today, engaging, informative, and unique content is what Google values. While content like that no longer ranks well on Google search results, the use of keywords remains integral to SEO. In this guide, we will explain how to properly implement keywords into your content. Keywords are the terms users search for before finding your website. If enough people search for a term or phrase on a monthly basis, it becomes considered a high volume keyword. The text entered into the search box is known as a “query. An example of a search query is “roofing company in Denver.” Roofers in the Denver area would, of course, like to rank for this query and should include it within their content. However, it should not be spammed in the way showcased from the example above. Google considers that kind of content to be spam. If you are ready to get started creating roofing content that ranks, we will cover all of these components and more. The first step to writing content is to determine your target audience and their user intent. Understanding who you are addressing and what their needs are will give direction and organization to your writing. Focusing on user intent is not only important for user experience but it is also an indicator to Google that your content deserves to rank for the right kinds of search queries. Search engines assess how effectively you address an audience based on how they respond to and interact with your content. The challenge is portraying that message clearly and convincingly. Authority is one way Google and its users become convinced that your content is worth their while. Remember, Google’s objective is to deliver its users the website that most effectively matches their search query and meets their need. Roofers who establish themselves as authorities are often prioritized. Establishing a target audience, researching their needs, and crafting high-quality content to communicate your services will endear your website to Google and consumers alike. Conversely, throwing something together in minutes will create disorganization and confusion. For example, if you are a roofing company in Denver, you may be presenting information that is already available online. However, you can present it from the unique perspective of your specific roofing company. You can lay the information out in a format that is easier to read, easier to navigate and across the board geared better toward your audience. You also may be presenting pages that do not exist in your area on specific roofing types, adding unique value to those pages. When you place keywords in your content you have to be careful to not stuff your content with them but to also retain enough for Google to understand what your page is about. As Google’s algorithm has improved, their ability to detect related keywords has also increased. In fact, Google wants to see not only the same keyword repeated but also related ideas. For example, a page about “Shingle Roofing” should also cover related topics like Composition Shingles, Asphalt Shingles and more. It should include related verbs also such as repairs, installation, and maintenance. Our Roofing Company in City is the best company to choose for superior service. Contact our Roofing Contractor today at 888.888.8888. Your meta description is a quick call to action and should include your keywords found in your SEO title. This content is some of the most important to your ability to succeed online. A poorly written SEO title or meta description can ruin your chances of optimization. After writing great content for your roofing company website, your work is not done. To reach the most possible users, content should be marketed through various channels. In fact, content marketing is its own subject altogether. The goal of content marketing is to create more visibility, build links, and brand your company throughout all corners of the web. Blog posts are often the best content-type to market because they can be published on social media networks such as Facebook and LinkedIn. Not every page of content is going to go “viral.” In fact, in the case of roofing contractors, very few of them will. But remember that reach and visibility are both relative to the competition. If you can generate more traffic than the next best roofer in your service area, you are winning that battle, and securing the highest possible ranking. Tired of watching your competitors beat you out online? Talk to our outstanding team today. Call (800) 353-5758 to discuss all of your content needs in 2019. 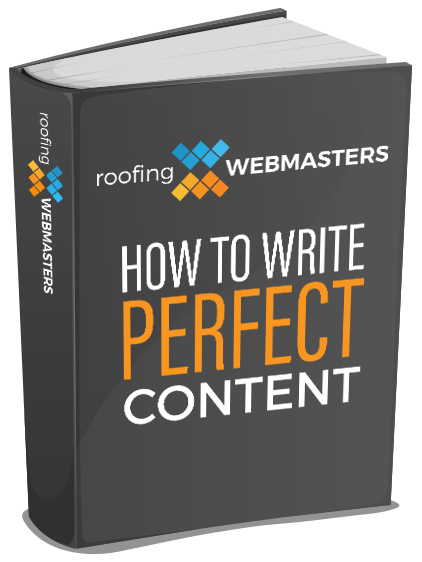 Download The Free PDF for How To Write Perfect Content From Roofing Webmasters. Updated on March 14, 2019 at 3:06 pm by Roofing Webmasters.